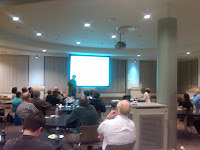 Last night, I once again made the sojourn to the South Coast Revit User group. Once again, this meant that I was a stranger in a strange land. But as always, the members of the user group were more than welcoming. Speaking that Thursday night, was Will Harris of WILL2PLAY. He gave an excellent presentation about how Autodesk Revit was used to design an addition to a Gothic church. Sorry about the picture. A Blackberry can only do so much. And while the technical achievement was incredible, what I found much more fascinating was his talk on the actual implementation process itself. He spoke about a lot of the challenges it takes to perform an implementation, starting with the fact that a Gothic church is probably the toughest project to start with. He continued into the constant, ongoing challenges of developing and maintaining the standards, and finished with the fact that he bought a lot of lunches as he got acquainted with the team he was working with. And, while Revit was a worthy feather in Will's hat, the things that struck me weren't necessarily the technical aspects. So, while some of the biggest things I learned (and having forgotten a few things, relearned) weren't the button clicks, what were they? Mistakes are made, things go wrong in spite of the best efforts of the team. Make sure you have back up plans and procedures just in case. For Will's experience, he talked about having to restore standards that were accidentally overwritten. A good backup plan meant restoring it in a few minutes instead of several hours. All the software in the world can't help you if you don't have people motivated to learn the software and implement it. And that doesn't mean you fire your team and replace them with new hires. It means learning what makes your team tick, finding a way to give them direction, motivating them, and making them want to achieve the goals. So those were the big lessons from Mr. Will Harris. We all love the tech. I wouldn't blog if it weren't for the fun tech I get to blog about. But there's more than the tech. Once the network license is running, the integrations are tested, and the updates installed. There's the trials and tribulations of the real world. If we lose sight of that, we're forgetting a huge part of the picture. Thanks for the presentation, Will! So what is in a name? 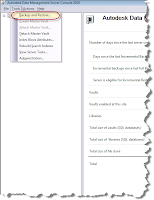 If you've read the Vault literature, you know that you probably know that Vault uses a database that allows you to search by multiple criteria to find a file. So now instead of having to recall a file name, you can also use the file properties like author and description (among many more) to search for your files. This greatly increases the ability you have to search for files. As I've used Vault for my woodshop projects, I've found that I don't have to be as careful with my file names, since I have other ways to search for the file. But I've also learned that it doesn't mean that I have an excuse to be sloppy with my file names. Luckily, Vault gives us a way out should we ever become careless. In this example, I've got a bookshelf that I modeled from some plans in a book for a future woodshop project. Okay, it may be distant future, but I swear I'm going to build it someday! In any case. In this scenario, I've placed my files in Vault, like a good data manger should. But there's a problem. When I saved one of the files, I forgot to change the default name. I've accidentally given it the name of 'part4.ipt'. As I said earlier. This doesn't really bother Vault much. I can leave this file name unchanged, and lead a happy life. But I also said we shouldn't use Vault as a reason to be careless, especially since Vault gives us a way to change the file name. 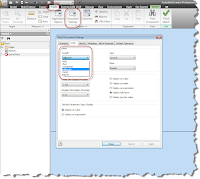 Once the file is in Vault, all you need to do is right click on the file name in Vault Explorer, and choose 'Rename'. The wizard will ask you if you want to add more files to the rename wizard, 'while your at it'. Although for this example, I'm only changing one. With this step done, Vault shows you which files it's going to repair. That is, which references will be adjusted to fix the links. Next, you can choose what name you want for the new part. Notice that you can also update the part number with the new filename (assuming this is how you number your parts). You can also create part numbering schemes here, if you have another method to number your parts. Now the file's name is changed! But Vault also notifies all the components using the file. So you don't have to resolve links for any lost files due to the rename. Vault takes care of that for you! You could call it a basic trick, but it's a common thing we all have to do. And aren't the best tricks the ones that we use day to day? Microsoft Windows Uninstaller - There's always another way. So this isn't really an Inventor, Showcase, or Vault tip. But it's an issue I've run into a few times, and it's definitely worth mentioning. Every once in a great while, a Windows program doesn't install, or uninstall correctly. Okay, the 'virtual peanut gallery'' will probably say 'Jon, that's every time you uninstall a Windows program'. But what I really mean is, something goes screwy. I mean that you can't install the program because Windows thinks that the program is already installed, but you can't uninstall it because it doesn't show up in the control panel. Well, there are things like using Windows restore points, but let's be honest. But have you used one of those recently? If the answer for you is 'yes'. Congrats. Pat yourself on the back. If the answer is 'no'. Welcome to the club, my name is Jon, I'm a charter member. Look me up when you arrive. That's right, I'm as guilty as anyone. There's also the 'scorched earth' approach, where you completely format your computer, and reinstall everything. This can be fun in a 'geeking out' sort of way. It also gets rid of any other 'nasty bits' that could be lurking in your computer. But, it's also time consuming. 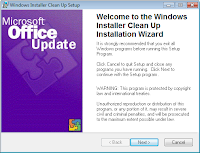 Microsoft issued a little program called Windows Installer Cleanup Utility. You can download it from Microsoft's site by following the link HERE. The program starts, and you'll see a list of all the programs that Windows sees. Many times, the programs that don't show up in the control panel will appear in this window. Pick your program, uninstall, and now you can try to install again if you need to. Of course with anything, there are disclaimers. There has to be. Don't use this instead of the standard uninstall practices. This is only for when the standard methods fail. 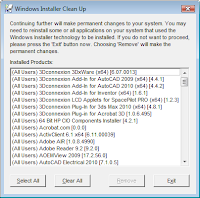 Is the program going to fix every install/uninstall issue you're going to encounter? No. Sometimes, it really is that bad, and you may have to try that aforementioned 'scorched earth' policy. That being said, this utility HAS saved me from having to get more drastic in the past. And this has been a blessing when a reinstall means several hours moving data around and getting a system back up to speed. So in that sense, I've come to view it as my snowboarding helmet. It only had to save me once to be worth it! A few weeks ago I wrote a blog on using a script for an automatic backup. I mentioned that manaul backups are also possible, and even talked about the steps. This time, I'm going to go a little deeper into them. First, a bit of a refresher, and some explanation, on the manual backup process. One the machine acting as your Data Management Server, open your Autodesk Data Management Console. When the Data Management Console opens, choose Tools>Backup and restore. The backup and restore screen opens. This is where you can create, or restore a backup. Today, we're going to create the backup, so choose the 'Backup' radio button. Click next, and now we get to the core. First, you can choose a full, or incremental backup. The full backup option does just what it says, it backs up all the data in your database and filestore. Incremental only backs up only the changes since the last backup. This option cannot be used unless a full backup has been performed first. Today, I'm just going to use the full backup settings. We can also set the path, which is the location where the files are saved. Next we have the 'Validate' check box. Setting this will have Vault go back and validate that we have a valid copy. It's not necessary, but I usually set it. You might call me paranoid. I like to use 'prudent'. It has a much more positive ring instead of the 'eyes darting nervously around' connotations of 'paranoid'. Last, we have 'Backup Standard Content Center Libraries'. These are the standard nuts, bolts, etc that ship with Inventor. These are read only files that don't change, so the only benefit you gain in backing them up a reduced number of steps should you need to restore a database. Choosing not to save them can save about 3-5GB of drive space however, so this is worth considering. 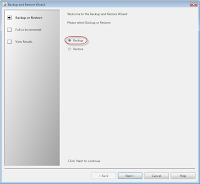 Unchecking this box means the Standard Content Center Libraries are not backed up, but should you need to restore a backup, you'll need to grab your Vault disk and reinstall the libraries. For routine backups, I'll skip the libraries. Disk space is cheap, but not so cheap that I'm going to backup 3-5GB of redundant data every night! However, if I'm doing a 'test', I'll usually grab the libraries too, if I need to restore, then I can restore in one step. Then just hit 'Finish', and away your backup goes! It will finish, and the files will be stored in a directory with a name with the following format. This directory contains all your Vault data. Don't lose this. Treat it like the United States Secret Service treats the 'Nuclear Football' with the nuclear launch codes for the U.S. arsenal. So, now you've stored your Vault backup under lock and key, safe from harm. But Why? You might think that with a backup script, why would I ever want to perform a manual backup? When I'm going to migrate a vault from one version to another, I'll make a manual backup. Why? It ensures that I have the most current data from the moment the Vault was shut down. It also makes sure that if there's anything wrong with the scripted backup, I have an additional fall back point. That's right, I make a backup for the backup. But my peace of mind is worth it. 2) I'm going to try something 'death defying'. Sometimes I want to try something with my data that falls into the "It's crazy! But it just might work" column. Typically, it includes manipulating, copying, or deleting data that should address an issue. In theory. If I create a backup manually. I can safely experiment on the latest data in a test environment until I'm sure it's safe on the live data. There's that 'peace of mind' thing again. 3) Any time my data and I need a 'warm fuzzy'. In other words, sometimes my peace of mind is reason enough. So now, you may find yourself questioning my faith in the Vault backups? You may be asking, "Jon, don't you trust the stability of the Vault backups?" The short answer. I do trust my backups. As a matter of fact, I can't think of a time when a backup that was properly created failed on me. But that doesn't mean it'll never happen. It also doesn't mean that the automated backup that's supposed to have been running for months wasn't inadvertently turned off three months ago, and the backups you thought you had, don't exist. Trust me, I've seen it happen. The latter is particular scary for extremely large values of 'x'. While training a class last week. Employing units measurements in models became the subject of discussion. Mostly it revolved on mixing units. Here in the United States, we use feet and inches. The most common unit I'm accustomed to when designing is inches. It was the unit I worked with mostly in industry, although I've also done a fair amount of work in millimeters as well. During our class we talked about how to best use the units in Inventor. And like with so many things in CAD, there's never one right answer. But there are some tools that can be taken advantage of. Inventor part and assembly all have a default unit. Out of the box, Inventor comes with templates in millimeter and inches, but those aren't the only units you have available. In your part and assembly files, if you go to Tools>Documents and Settings, you can access the units. 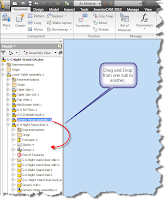 Here you can change the defaults unit of a given model file. But what happens if we want to use a different unit in the drawing? Type in the unit at the end of the number. So if we're using the same inch document above, typing in '15mm' will result in Inventor converting the number to .591 inches. In effect, Inventor divides by 25.4 for us, saving us the conversion. By the way, Inventor carries out to twelve decimal places, so the .591 inches you see are just what Inventor is displaying. You can create equations to help combine units, and save you the trouble of doing the math. Below is an extrusion with a bit of a whacky equation. '1ft+125mm+3/32'. Inventor has converted the 1ft into 12 inches, converted the 125mm to 4.921 inches, then done the math to add the 3/32 inches. 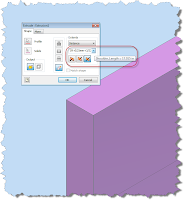 You can get even more complicated if you need to, Inventor can do quite a bit with units. So now you can take Inventor and see what you can do with the equations. You can do a lot! You can also use the 'ticks' for units as well. Try typing something along the line of 4'6" into the dialog box. Inventor understands that that's 4 feet 6 inches. And the last note. 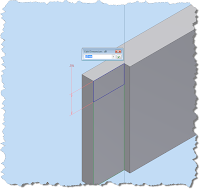 Don't forget the dimensions we use in the model don't have to appear that way in the drawing. Things like fractions, units, and dual dimensions can all be shown on the drawing using dimension in the drawing. So don't forget you have additional flexibility there too. Below is an example of a model I created for my woodshop projects. The models are all created in inches, but the drawing units are dual units in decimal inches and fractions. Why? When I was taking my woodshop classes at the local city college, I found that because of my design work, I liked to work in decimal inches. But many of my classmates worked in fractions. So I created a dimension style to use both! So that's a little bit on units in Inventor. I like to set my document to the most common unit that I expect to use, then type in the units for anything that differs from that default. Tonight I decided to try my hand at creating another video. It's been a while, but it's always fun to create one when I have a spare evening. I created this video based on the 'Night Stand Project Reviewed' blog I created earlier this week. In particular, I'm referring to where and how I used view representations. Anyway, a picture is worth a thousand words! So check out the video below. I hope you all like it! Well, I finally made it! The nightstand is modeled, it's drawings completed, and now it's checked into Vault Manufacturing. I'm reviewing the files for missing dimensions and the other little things, but the heavy lifting is over! So what are some of the lessons learned in this particular affair? True, every time you check a file into Vault, you're going to create a version. There's no denying that. It's also true that this takes up more disk space (because of the multiple copies) than just saving the file into the workspace, and overwriting it on subsequent saves. I know that I'm guilty of having a visceral twitch to creating extra versions. It's like admitting that the previous version had something wrong with it, and I hate making mistakes. However, I also found through this exercise, that I rarely, if ever, regretted having the extra version. It gave me fallback points when I made a mistake, and also let me rest assured that when I backed up my Vault to my external drive, the latest versions of my files were being backed up with it. So I came to the conclusion that in the long run, the versions aren't as bad as they sound. On the contrary, they can save you a ton of time. Take advantage of all the tools you have at your disposal. At first blush, this might think that this project was pretty simple. Almost every component is rectangular. It doesn't get any simpler than that! But there were definitely some tools that I found very useful, that I hadn't planned on using. View Representations. 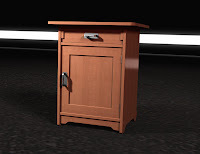 The floor of the night stand has fasteners in it that are used to connect the back panel. But when dimensioning the actual assembly, I didn't want the fasteners shown in the view. I created a View Representation that allows me to make them invisible for that view. Promote/Demote Components. I changed my mind on BOM structure more than once during this project. I decided that a component that was originally in Subassembly 'A' would be better placed in Subassembly 'B'. Recall that you can drag and drop a component from one subassembly into another. Okay, this is a little tongue in cheek, but I'll own up to the fact that I didn't bother to put things in the correct folder every time, or ignored a misnamed property or two because I knew that Vault would let me fix them later. I usually did this when it was getting close to midnight and I was just trying to 'squeeze out' one or two more files. While that's true, and Vault did allow me to move and rename files without much hassle (which is one great advantage of Vault), I still had to go back and make sure to perform all the corrections that I'd let slide because I got a little lazy. So one of my New Years resolutions is going to be; If I tell myself 'It'll be okay for now', rethink it. It very well might be okay for now. But then again, when I have to go back and make the changes, I might also be grumbling about 'why didn't I just get it right the first time?'. Happy New Years, everyone! Here's to a great 2010!